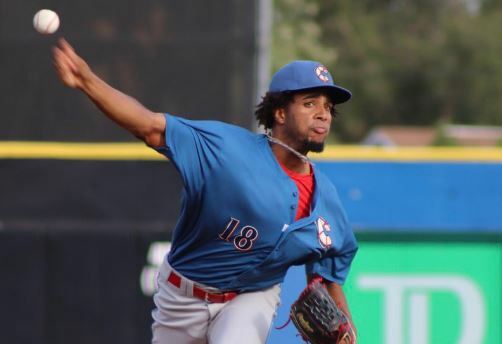 The Phillies’ rankings went through some changes with graduations (Scott Kingery, J.P. Crawford, Jorge Alfaro , Nick Williams) or trades (Ricardo Pinto, Elniery Garcia). The biggest change, however, is right at the #2 spot, with Alec Bohm, showing up right out of college. It was a smart pick for them to replenish the offensive part of the system. The organization is stacked with young, talented pitching after having some success in the draft and with International signings. The offense is where the biggest concerns lie. All in all, however, the Phillies still have a very strong system with a lot of potential. All stats listed below are current up to July 23rd. Currently on the Disabled List for the Threshers with right elbow inflammation. Limited to only 46 2/3 innings pitched this year but is widely believed to have ace potential. It’s possible, the team’s reluctancy to trade him is the reason Manny Machado is a Los Angeles Dodger. Philadelphia’s 1st round selection this past June out of Wichita State. I reviewed Bohm’s potential here when he was drafted. He’s currently on the DL after getting hit on his knee from a pitch. The big man picked it up after a slow start. Future middle-of-the-order slugger here. Medina started off slow but has also looked sharp in his recent outings. He participated in the Futures Game on July 15th in Washington, D.C.
Stats: 16 2/3 IP, 1.62 ERA, 21 K, 0.66 WHIP for Reading and Lehigh Valley combined. 34 1/3 IP, 2.10 ERA, 44 K, 0.76 WHIP for Philadelphia Phillies. Moved to the bullpen shortly after my Preseason Phillies Top 50 was released. Has continued his dominant season to the Major Leagues. Recently promoted to Double-A, Haseley has been showing a solid hit-tool and some power this year. Walks continue to be an issue for Kilome. The stuff is there but the results need to start improving. Had a solid season for Double-A before being promoted to Lehigh Valley recently. Scheduled to make MLB debut for Phillies on July 26. Showing good strikeout numbers for Single-A again this year. Stats: 95 1/3 IP, 1.89 ERA, 87 K, 1.08 WHIP for Lehigh Valley. 10 2/3 IP, 6.75 ERA, 8 K, 1.50 WHIP for Philadelphia Phillies. Appeared in two games with the big-league team this year and didn’t look too bad. The young shortstop has done well this year both defensively and offensively. He jumped up in the rankings based on his successful year and future potential. Stats: 2 IP, 4.50 ERA, 3 K, 2.00 WHIP for Reading and Lehigh Valley combined. 35 IP, 2.57 ERA, 39 K, 0.81 WHIP for the Philadelphia Phillies. Doing very well for the big-league team’s bullpen. Has been seeing some high-leverage spots, as shown by his 3 saves. Could be a future lights-out closer. Strikeout ratio is up and ERA is down in his first year in Triple-A. Pitching well for Double-A in his first year there. While Pujols is still striking out a lot, his current rate of 37% is lower than last year. That, along with an increased walk rate and more power is what is driving him back up the rankings. Just activated from another DL stint. Quinn has so much talent but struggles to stay on the field. He would make a solid top-of-the-order guy if he can get in the lineup. The former 2nd rounder is holding is own in Lakewood. Still showing the power he showed us last year. A lot of power but a lot of strikeouts too. Hasn’t pitched since 2016 due to injuries but has great potential. Currently on the DL after a successful 2017. Currently on the DL, Falter is having a very solid year for Clearwater. Great defender with some speed and a solid hit-tool. Could develop into a leadoff hitter. Struggled a little bit since his promotion to Double-A but small sample size applies. In his 19 innings pitched for Reading, he has 18 strikeouts. 1st round pick in 2015 still trying to find his swing in Reading. 1st round pick struggling in Single-A. Has showed great power and a solid at the plate this year over two levels. Struggling this year after posting better numbers previously. The talent is there though. Eastern League Home Run Derby Champion is showing more pop this year. Could see a taste of the majors later this year. Despite going back and forth between the starting rotation and bullpen this year, he has pitched well with a WHIP of .87 and a 1.42 ERA in 50.2 innings pitched. Eastern League All-Star coming into his own this year. The 6’10” lefty is having a solid year for Lakewood. Showing a lot more power than last year with improved OBP. Currently on the Disabled List after throwing only 3 2/3 innings this year. Striking out over a batter an inning again this year. 2018 5th round pick out of Notre Dame. So far over two levels of Single-A ball, he has a slash line of .374/.412/.516. Could project to a 20/20 hitter and could move fast through the ranks. Solid defender working on the hit tool. Has potential to continue to improve. Middle reliever has been up and down between Triple-A and the majors this year. Finesse righty has been struggling this year. Currently on the DL for the Threshers. Prior to the injury, was struggling to a 7.22 ERA and a 1.40 WHIP in 28 innings pitched. Had an impressive first half with Reading, making the Eastern League All-Star team and was rewarded with a promotion to Triple-A. Not showing much success in the minors after being selected in the third round in 2016. Arauz is struggling in his second taste of Double-A ball. Opening some eyes this year with great strikeout totals. Slightly older for the level but is doing very well. His successful minor league numbers haven’t shown up in the few innings he has pitched in the majors. A great defensive shortstop and, at only 18-years-old, has room to grow and develop. Good on-base skills and some power. Second straight solid season for the left-hander. Doing well in his debut year in Double-A striking out over a batter an inning after a solid year closing for Single-A teams last year. Struggling for the second straight year for Lakewood. Has some potential to help in a utility capacity if it comes together for him.